Last weekend I made this hanging herb garden, a great solution for my tiny kitchen which has, oh, about 24" of counter space. At first I'd planned on mounting mason jars to a board which would lean against the wall but on my way to the hardware store it occurred to me to do it this way, which involves less infrastructure and is probably a little easier. I find it helps to do make these while the rope hangs. Hang it from a back-of-the-door coat hook, or nail a small nail somewhere about 7' off the ground. For each 3-plant hanger, you'll cut 3 pieces of cord 14' long and 4 pieces about 15" long (for your stop knots). Line up the ends of your long cords and fold in half. You should now have 6 lengths of 7' cord. About an 1.5" from the bend in your cord, create your first stop knot. Mine had about 4-5 loops. 10" from your top stop knot, take two neighbor cords and tie a basic knot. Repeat for each pair. 4" down from the last knot, tie a basic knot between one strand of two neighboring knots. Be sure to be joining two cords that are already close - do not cross over a cord to tie to another cord. See the diagram and photo. Repeat for each pair. 4" down from the last row of knots create another stop knot. Repeat steps 3-5 twice more to complete one hanger. Repeat all the steps to create your second hanger. I used mason jars. I've had some hearty herbs in lesser containers so I'm hoping they'll work. I put small rocks at the bottom of each jar, transfered the herbs, adding potting soil when necessary. The nursery didn't have basil starters yet so I'm growing them from seeds. Fingers crossed! You'll see that mine are different lengths, I started the first hanger with less cord than I needed and adjusted for the second one. I have no idea what I'm doing with that branch. How have you grown herbs in your home? Any other small space solutions? Have you done more adventurous macramé? As it's now been weeks between when I did this and when I'm posting this entry, I'd definitely say put your plants in things meant for plants, not mason jars. What was I thinking? Great idea. I would probably put them in a plastic flower pot first, so the drainage is a little better, and then if they die - which my herbs do, you can whip it out and replace easily. Yeah, I'm wishing I'd gone down the flower pot route! love it. what a great idea for keeping a few fresh herbs in the kitchen. It decorative, it does save space, and it's a creative solution. But the plants have their own needs, different from ours: a) light 2) water. In case of herb plants, they need to be on a window sill, and their containers should have opportunity to drain excess water. What a great idea. 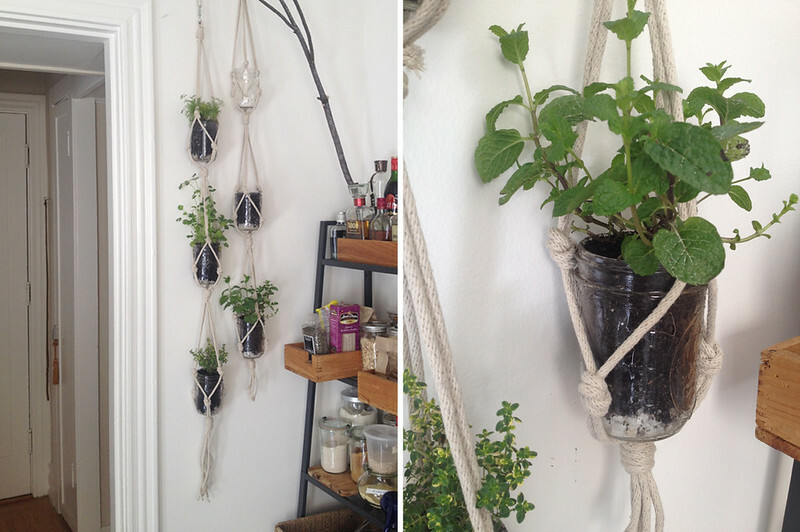 I was looking for ideas to hang plants on my balcony - will definitely give this a try!